Diesel has been known for producing ads that invoke surreal images in lieu of direct product details, in partnership with Swedish ad agency Paradiset DDB, Stockholm. Diesel’s unique international marketing strategy is innovative and has been studied by universities and institutions as a model. To identify the marketing principles underlying the design of the Diesel Website. This project is based on the Diesel Case study “branded hedonism”, the semiotic analysis of Diesel Prints Ads by Merris Griffiths as well as others reports and articles such as Heavenly campaign “Diesel taps Richardson and Wilson for sacred and profane fall ads” and the Driving force behind Diesel published by the Business week magazine. After having read the reports mentioned above. The first step is to establish criteria to evaluate and assess the DIESEL website since the marketing perspective. A well defined website must address issues regarding interoperability & usability, functionality, security and privacy; services & products delivered, content provision, etc. Please refers to Table I to see criteria established to assess the DIESEL website. The second step is to perform a SWOT Analysis for the DIESEL Website. By performing such analysis, we will be able to weigh up the fit between the company’s strategy regarding e-marketing, its internal capabilities, and external possibilities. To place more advertisement for there products. To attract customers from those intending to buy from their competitors. To create campaign specific websites that perfectly complements the story of their campaigns and provides a closer relationship with their audience. Reinforce existing affiliate programs and introduce new ones. Find a new niche market and expand the current one by encouraging current customers to wear DIESEL products more frequently or in more situations and by attracting customers who intend to buy other brand named jeans and accessories. 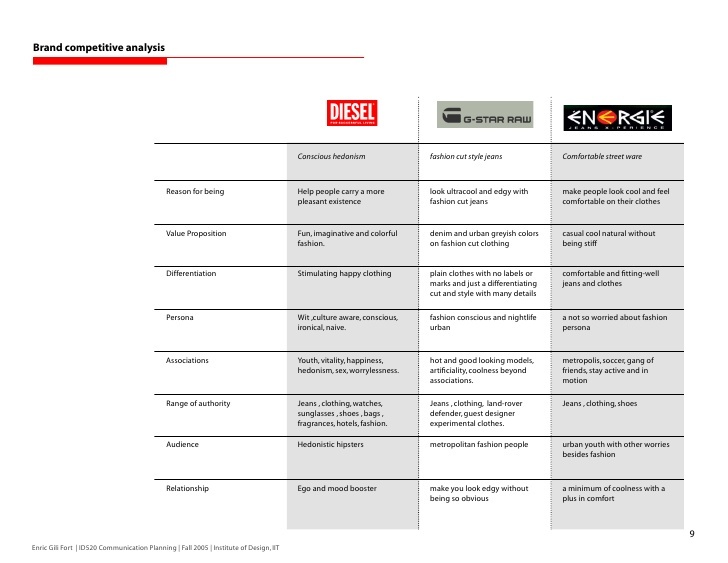 Diesel marketing strategy is based on differentiation and focus. The company marketing efforts are emphasized in building brand awareness as well as customer loyalty. The company also recognizes that not all the markets are homogeneous so that DIESEL is aimed to target a premium niche where market and industry standards are ruled by outstanding design, outstanding advertisement, excellent channels and exclusivity based on price. DIESEL primarily directs their marketing towards young professionals who are very informed, intelligent, and individualist persons and who want to look stylish and sophisticated. DIESEL primarily relies upon its advertising campaigns to drive sales ahead. Indeed, the company’s website perfectly complements the story of its campaigns and provides a more dear relationship with its audience. The company also advertises in commercials, TV shows such as MTV, fashion magazines and billboards. 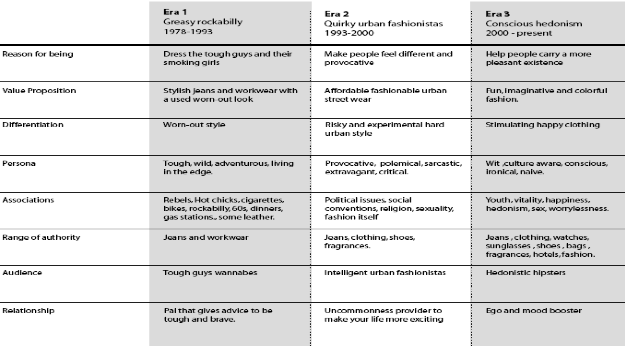 Diesel’s target market are single men and women 18 to 35 years old, it is young and hip. “Diesel uses a combination of the old and new logos. The Mohawk is still used in the trousers labels the red box is mainly use for the campaigns and the D is used to label products at the side of sunglasses, in the back of the jeans. Diesel Logo reference to the fuel as the energy needed to have a successful fashion experience”  The company also has six sisters’ brands (Diesel Kids, Diesel Style lab, 55 DSL and so on ) which have a completely different style. At the beginning Diesel was recognized by customers as a jeans and work wear apparel brand, but the company and its offerings has evolved in a fast paced way that at present it is perceived as an urban fashion brand which is clearly displayed in its website. DIESEL closely integrates all of its marketing sales and efforts to project a consistent image as well as a consistent positioning of its line of clothing and accessories. The image that DIESEL wants to portray to customers is that its brand helps people carry more pleasant experience thorough edgy and fresh designs. Throughout its offerings DIESEL persuades customers to be happy and not being worried –centered as well as enjoying life as much as they can but without being too shallow and being aware about the world they live in. Diesel promotes the concept of individual liberty by cheering people to wear cool designer clothes to reach their own state of happiness. The company differs from its competitors because it always tries to give the clients special, unique and innovative designs. The slogan “FOR SUCCESSFUL LIVING” has been the key differentiator for DIESEL regarding its positioning statement. The position achieved at Diesel Web site is outstanding. DIESEL has built a Web site that’s positioned to actually sell HIGH END STYLE STYLE IGHAND EXCLUSIVITY over the Web. CONTENT PROVISION Determine whether or not the content provided by DIESEL is intended to be of general interest and it addresses customers’ needs. The Website provides users with resources for contacting the company’s key management team via electronic mail. The website of the Diesel clothing company gives details of the current collections for men, women and kids plus denim and accessories. The site also contains an archive of Diesel advertisements, or ‘guides to successful living’, as well as a store finder, company information and details of Diesel’s support for new talent in fashion, music and new media. Spread over hundreds of pages, the Diesel site not only offers fashions, but interactive, futuristic games like G-Police 1 and 2, and high-tech video artwork from 55DSL Extreme Sports. The website provides a Link TALENT SUPPORT where artists, designers and musicians can find information on how DIESEL promotes creation by sponsoring events. The content is updated, dynamic, readable and properly broken down. The website uses flash, other type of moving content. If applicable, there is a mechanism provided within a script or applet to allow users to freeze motion or updates. The site was aiming at being different and it is different, and what is interesting about it is that it goes one extra step by being interactive as if it was a two street and they are listening to you too, they are not just simply showing you their products. They are aiming at winning you as a faithful customer that believes in what they believe in. Which is very smart marketing move especially with the age of their target market. COMPLIANCE SECURITY Determine whether or not DISEL website has security and privacy policies in place to addresses legal issues such as IPR, copyrights, freedom of information, data protection, personal confidentiality etc. website content is legal and addresses issues such as IPR, copyrights, freedom of information, data protection. MAXIM and Cosmopolitan’s websites have provisions that build trust and security for all its customers. The “Privacy Policies” links on both sites are there to alleviate the necessary fears of fraud when users want to purchase products from the site, or the privacy of their personal information during the use of online chats, discussion/message boards, etc. Both sites make use of the Secure Server Hypertext Protocol (https) when customers are conducting transactions. These secure servers provide the necessary security for transactions carried out. This, in turn, makes MAXIM and Cosmopolitan customers, at all times, feel safe when they interact with the websites. E. Users experience difficulty when screening PDF files, flash applications, JPG graphics, and problems with colour contrast, fonts, and bold text. s.
G. Services and information can be accessed anytime and anywhere by people with disabilities or literacy challenges. Both: When I typed in “Cosmo magazine” and “Maxim magazine” on the search engines of google, yahoo, and msn, the magazines’ homepage (www.comsopolitan.com and www.maximonline.com) always came up first. Therefore, it is very easy to find these websites. DIESEL offers a catalogue, which is easy to use so that visitors can find the company’s offerings. The Diesel New Art talent support program attract opportunity seeker willing to help market your products online. Lack of mechanisms for collecting customer’s feedback. 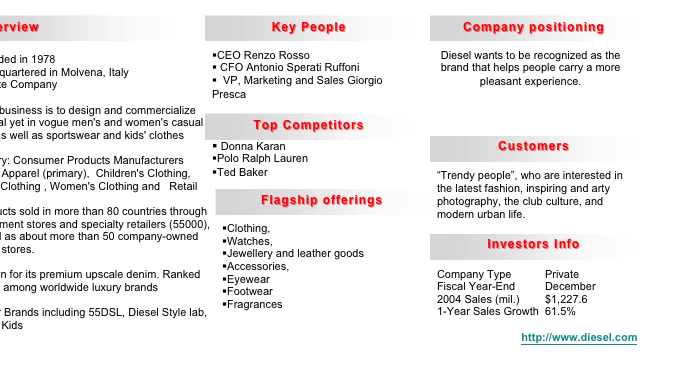 Introduction of innovative business models. Businesses are embracing automation as a tool for improving performance. Local and International fashion and musical events where DIESEL offerings could be highlighted. Diesel owns shares in Victor & Rolf, Maison Martin Margiela and DSquared2. In 2002, Diesel collaborated with Karl Lagerfeld on a denim collection for Lagerfeld Gallery. Renzo Rosso has been nominated for both Entrepreneur of the Year and has won Advertiser of the year. Diesel jeans are only manufactured in Italy. Not true. Diesel co-manufactures the underwear line with Mast Industries in the US, which also manufactures Victoria’s Secret products. Diesel Denim Gallery is a gallery like space, which offers special edition jeans.